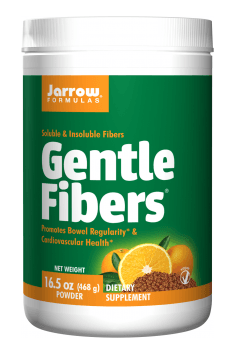 Jarrow Gentle Fibers is a formula with a high-quality blend of soluble and insoluble fractions of dietary fibre in a convenient powder form. The supplement promotes healthy digestive function (helps combat constipation, promotes the growth of beneficial microflora and aids in losing body weight) and influences positively the functioning of the cardiovascular system (helps stabilise blood cholesterol and sugar levels) and the immune system (strengthens immunity and prevents infections). Dietary fibre, otherwise known as roughage, refers to a big and diverse group of substances which are resistant to digestion and absorption in the human small intestine. They are only partially hydrolised by colon bacteria. This group includes, among others, polysaccharides (cellulose, hemicellulose, pectins, natural gums and mucilage) and non-polysaccharides (lignins and indigestible lipids – plant waxes). Due to characteristic properties of specific fibre fractions, it is divided mainly in terms of solubility – to soluble and insoluble in water. Soluble fibre is fermented by colon microflora. It helps treat constipation, stimulates the differentiation and proliferation of intestinal epithelial cells, promotes the growth of beneficial microflora, aids in maintaining a normal pH in the intestines and may be an element of preventive healthcare for colon cancer. Insoluble fibre fractions contribute to improving the intestinal transit, increasing the volume of gastric contents and the amount of toxins and metabolic by-products excreted through the digestive tract. Sources of soluble fractions of dietary fibre in the formula are flax seeds, orange pulp and peel, arab gum arabic, fructooligosaccharides (inulin) whereas insoluble dietary fibre is provided by chia seeds and flax, which is also a source of the first fraction. Chia seeds are characterised by a relatively high content of dietary fibre which comprises mainly insoluble fibre. Its main ingredient is Klason lignin which has been proven scientifically to regulate parameters of the lipid profile, primarily due to the ability to bind bile acids and hypolipidemic properties. Flax is an excellent source of dietary fibre, both insoluble (lignin and cellulose) and soluble (mucilage, gums and pectins). The ratio of soluble to insoluble fibre in flax seeds is about 40:60. The fibre in flax seeds absorbs water. Because of that, it swells up when it is consumed with food, thereby promoting satiety and thus curbing cravings for food. It shows therefore laxative properties and increases stool volume, consequently reducing constipation. What is more, flax seeds contain approximately 800 times more lignans than any other vegetable sources. Lignans help maintain normal levels of steroid hormones, both when they are elevated (protects against high oestrogen levels by reducing the incidence of hormone-dependent cancer – mainly breast and ovarian cancer) and too low (has a mild oestrogenic effect – relieves menopausal symptoms and prevents osteoporosis). Guar gum is a natural substance derived from beans of the plant Cyamopsis tetragonolobus which is a source of a soluble fraction of dietary fibre. It helps stabilise blood pressure and blood cholesterol and triglyceride levels. It is also important in the treatment of type 2 diabetes – aids in maintaining normal blood sugar levels. Inulin is a natural polysaccharide which belongs to fructooligosaccharides. It is referred to as a soluble fraction of dietary fibre. Owing to the presence of a β-2,1-glycosidic bond, inulin is not digested in the digestive tract. It is a nutrient for bifidobacteria that are responsible for maintaining healthy intestinal flora. Because of that, it is called a prebiotic. Since it undergoes fermentation, whose products are short-chain fatty acids (propionic, butyric and acetic acid), it prevents the proliferation of harmful bacteria, such as e.g. Salmonella and E. coli. Inulin demonstrates also hypoglycaemic and antiatherosclerotic properties (lowers cholesterol levels). To sum up, Jarrow Gentle Fibers is a formula which has many effects – promotes healthy intestines and improves their function, stimulates the growth of beneficial microflora and also supports healthy cardiovascular and immune function. It is recommended primarily to individuals who struggle with irregular bowel movements or constipation and may be also used by persons with overweight. The supplement may be also used as an element of preventive healthcare for diabetes, atherosclerosis, hyperlidemia and colon cancer. Stir 2 tablespoons (15.6 g) vigorously into a full glass of water or juice until dispersed completely. If allowed to stand, the drink mix will thicken. Drink with plenty of water. To maintain freshness, product should be kept refrigerated after opening. In the case of individuals who want promote weight loss, the best time to consume dietary fibre is just after a meal. This promotes satiety for longer and reduces cravings for snacks between meals. During fibre supplementation, it is important to ensure adequate hydration of the body – fibre absorbs water in the colon. When we do not provide enough fluids, its effect may be opposite to the expected one and involve constipation. Richness of vitamins and minerals It supports health and proper functioning of the male organism. Thiamine supports energy production and healthy nerve tissue.